This is my experience of the Michelin Pilot Power 3, no I'm not being sponsored by Mr Michelin, although one could be forgiven for jumping to that conclusion as I've used a fair few Michelins over recent years. Now I bought 2 sets of these, one in the standard size for my Busa, the obligatory 120/70-17 front and 190/50-17 rear. The second set I got with a 55 section rear. The set with the 55 section rear lasted around 8,500 km, which surprised me somewhat. One track day in late summer saw them respond nicely to a drop in pressure, but as this was a track based training day, we never got to stress the tyre to its true limits. In fairness this is not really the best choice from Michelin for track work anyway, and combined with a hefty powerful bike, it's fairly easy to find the traction limits of this tyre coming out of the tighter turns on track. Being a Dutchie there was obviously some maths involved in the purchase of tyres haha. 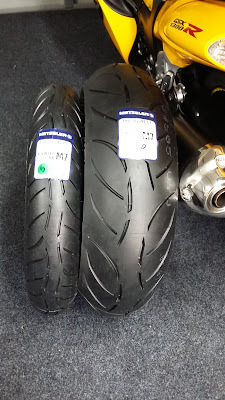 Had run two sets of Michelin Pilot Road 4 before the Pilot Power 3, following the same 50 and 55 section rear tyre trial. The 50 section Pilot Road 4 made the bike a bit sluggish to respond to direction changes, the 55 section Pilot Road 4 improved that a fair bit. Changing to the Pilot Power 3 was obviously going to be a serious change, especially as I started with the 55 section rear. Given the PR4 set cost a touch over $600 and got me about 12,000 km and the PP3 set was just on $400 and got me 8,500 km there was nothing in it looking at cost. The difference is in how the bike feels, obviously! A sporty bike feels more lively with a sporty tyre which the PP3 certainly is. Having run PR4 on the same bike it will come as no surprise that I prefer the PP3 as it lets the bike use its performance more freely, without unduly hurting my squeaky wallet. In the wet the PP3 felt safe and secure, if anything it was a straight match for the PR4, at least in my experience. Now I'm not a fan of riding in the rain as such, but it doesn't phase me either. It's obviously not a scientific approach, but the seat of the pants impression of PP3 was the same as for PR4. 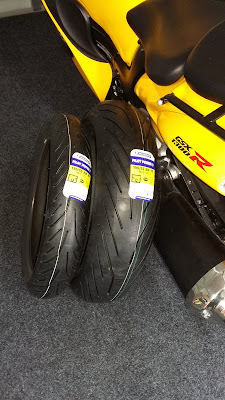 Now to add the impression of a Bridgestone S20 set that I ran on the Busa, straight after the OE Bridgestones were done, these S20s didn't like cold wet conditions at all. Given that the S20 and PP3 were developed at about the same time, one could reasonably make a direct comparison. On the basis of my experience, for my usage I'd not run another S20 or even the newer S21. Add in the fact that the S20s were toast after a mere 5,000 km, the value equation obviously favours the PP3. Yes it's that Dutchie coming out in me haha. One aspect that may disturb Michelin users, is the slight step in the tread that shows where the centre (firm) tread compound meets the edge (softer) compound. 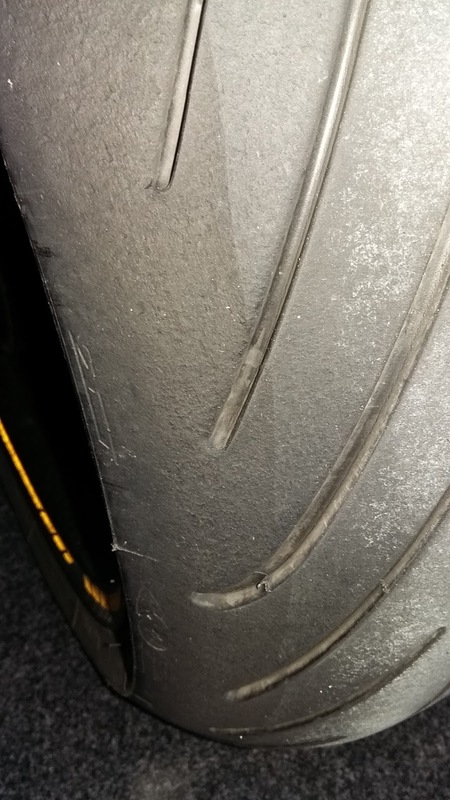 The pic below shows rear tyre on current set of PP3s which is down to 2.5 mm in centre. This will likely see rear down to legal 1.5 mm by the time 8,000 km comes around. Front won't be far behind by this stage, so that will see this set come off. Not just a visual thing, a distinct lip can be felt. Mildly alarming from a visual perspective, no worries in practical sense, the ridge where centre and edge compounds meet. Seeing it's been a year or two since I've tried another manufacturers' offerings, have got a set of Metzeler M7RRs sitting ready to take over from the PP3s when they reach the limit. 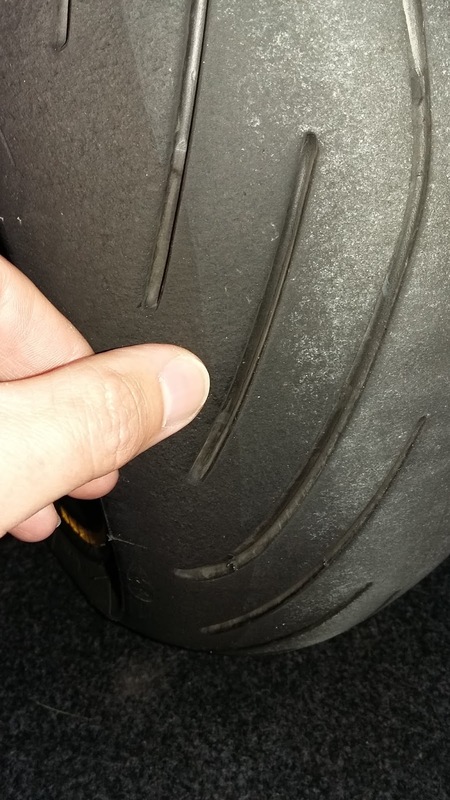 The Metzeler M7RR has a fairly narrow centre (firm) compound, along with some fancy varying belt tech to give life on the straights and grip on the bends. Be interesting to see how this plays out in real life. Yes I'm a bit of a nerd, fussing over tyre pressures and suspension settings from one tyre set to the next. Will report back once I've got a handle on how the Metzelers are progressing. In due course I'll end up on a sport touring type tyre again, just couldn't resist sampling the latest sporty tyre offering. All for purely scientific comparison purposes, honestly!! I'm a big Michelin fan. Not much wrong with the 3's but I found that they didn't last as long as 2's. My preference is the 4's in GT flavour. I've yet to try the 55 section - other Connie pilots swear by them but I'm a little concerned about clearance with my hugger. I can get anywhere between 9-12,000 out of a set depending on my behaviour...love the wet weather performance! Yes the Pilot Road 4 is a fine wet weather tyre. The nimbleness offered by the 55 section rear is uncanny, even if some of it may be imagination. Doubt it's hindering your progress any running the stock 50 section rear. Looking forward to Pilot Road 5s myself. Seems we're spoiled for choice.